Possibly some of the most underrated musicians in Athens, the UGA Redcoat Marching Band is almost instantly recognizable in the NCAA. The days are long, the work and heat extreme, but they still manage to have a great time. We asked our friend Matt, better known as Athens GA Weather, to talk about his days in the Redcoats. Marching in the Redcoat Marching Band was one of the most rewarding experiences in my life, and I will never forget all of the amazing memories I had. You get to meet some incredible people, and represent the University of Georgia. I played trumpet in the Redcoat Marching Band from 2005-2008. I got to perform in one of the best marching bands in the United States. 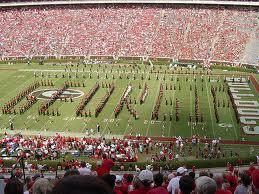 I will never forget playing Krypton during pregame at the Georgia Blackout game against Auburn in 2007. Watching our team win a SEC championship and beating a team who should have beaten you (LSU) was another highlight. (Yes, we were a good football team a long time ago!) What you might not know, is how much work we put into Redcoats. I wouldn’t say marching in the band was “difficult”, but very time consuming. We usually work on all of the stands and show music during sectionals and full band from 12-4pm. By 6pm-10pm, we learn the pregame and show 1 drill. After our day is over, we repeat the same thing for the next 3-5 days. During the school year, we practice Tuesday and Thursdays from 5:30-7:30pm. If there is a game on Saturday, then the band practices on Fridays too. Members actually register to play in Redcoats, and only receive one hour credit. Saturdays are typically an all-day event. We usually have to wake up extremely early and practice around 7am in the morning if it is a home game. Afterwards, we are on our own until the Dawg Walk starts up. On some away games, we might have to wake up around 3am or 4am to depart (especially if it is a noon kickoff). We easily put in 20 hours a week or more (depending if we have a game that weekend). It’s a lot of hard work, but it is so worth it. Everyone in the organization is great, and it really gives you appreciation for the university. Nothing finer in the land, than the Georgia Redcoat Marching Band! Go DAWGS! For more on Matt, check out his Twitter Page ( @athensgaweather), his blog on Athens Weather, and his major blogging site at EarthSky.org.